It’s reassuring to come home on a winter night and see the welcoming lights of the Brooklin General Store (and our Library, which we’ll talk about on another day). We’ve had a general store as the heart of the village since at least 1872, except for a worrisome 16 months that ended in June of this year. During those prior months, the rickety old store, shown here, was razed. The importance of an all-year/every-day general store to coastal villages cannot be overstated, nor can the difficulty of keeping such a store going nowadays. Our General Store is more than a local place to get basic groceries. Among many other things, it’s a place for fishermen and other early workers to have coffee, breakfast, and conversation beginning at 5 a.m.; it’s a café for residents and workers to get together for lunch; it’s also a nearby spot to get gas, oil, and air for the car, and it’s where you easily can pick up some beer, wine, or desert on the way home -- until 8 p.m. 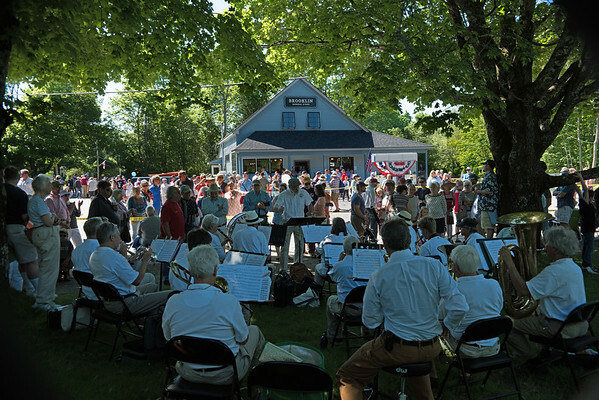 The General Store's parking lot and the Library lawn across the street also are congregation points for July 4th parades and other public ceremonies.